We had dinner at a very colorful Mexican restaurant in Austin, Texas, and the orange flowers with the pink stucco and blue dome made kind of a striking combination. . . .
Movers arrived yesterday (one day late) so we are surrounded by chaos. Hope to be on my regular blogging schedule soon. 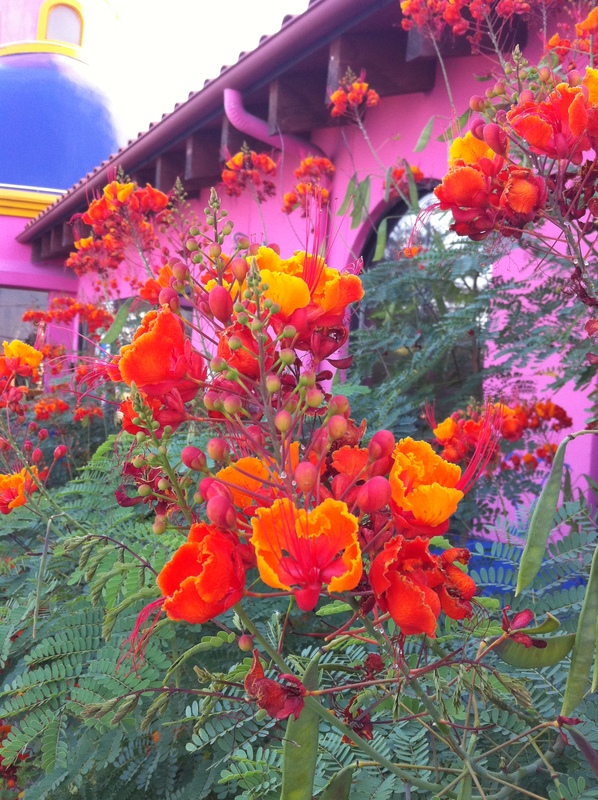 This entry was posted in photography and tagged Austin, blue dome, orange flowers, pink stucco, Texas. Bookmark the permalink. This has immediately become one of my favourite photos. It’s so amazing. I just realized that due to your change in tme zone I will only be able to comment the following day. No worries, Caroline. I will be posting much earlier than this. Couldn’t get WordPress to work on my phone, so went to two places for WiFi (we still didn’t have service) and their signals were so weak I couldn’t even sign in. Finally went over to my son’s house and got on, but it was nearly 2 p.m. by then. I should be posting before noon Eastern time. Thanks so much. The iPhone continues to amaze me. That is an interesting color combo! Waaaaait…you moved? But you used to be so close to me! I know! But don’t you have a brother moving out here? We will also be returning to the D.C. area to visit my husband’s family on a regular basis. My brother moved out to CA the last couple days of June…coincidentally, his movers are also late…except by a few days. We really busted our buns to get out here before the movers, so it was a little annoying, but it all worked out, because we were fried from the drive across the desert. That is indeed a striking color combination. Oh yes, it could have been worse. Our driver said he knew a family who lost everything because a new driver didn’t know how to drive in the Rocky Mountains and burned up the brakes. The entire van went up in flames. Can you imagine? That is some story! What a crazy experience. Finding a good mover is so difficult. Oh my … such rich, ‘hot’ colours and tones! How are things, Cheryl? Hope it’s not too hot. I can’t believe I need a sweater at night here! Jeanne, thank you. We did have a lovely 4th, despite being worn out. 🙂 Hope you did too.